This is the only picture I have of this home cooked dish. 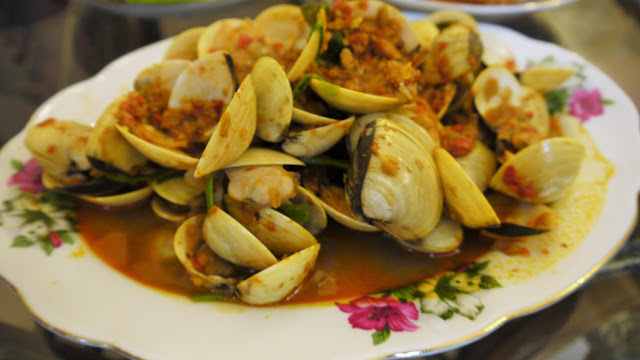 Kam Heong Clams or Golden Fragrant Clams is the family's favourite at seafood restaurants. This is my first time replicating it and I hope you can try this too if you had not cooked it at home. A very quick stir fry dish which is best to be eaten while it is still hot and fresh from the wok. Hence, the only picture I quickly took seconds before the family tucks in. This is also one of the dishes which I observed my DH ate heartily with his rice and even complimented me. A very rare occurrence indeed! Clean and soak clams in salt water for 30 minutes. Mix all the seasoning ingredients, stir well and set aside. Stir fry curry leaves in a hot wok with oil. Add chillies and dried shrimp until fragrant. Add in chopped shallots. Toss in clams and seasoning sauce. Continue to stir fry until clams are coated with the sauce. Cover the wok and let the clams open up. Do not over cooked clams. Above measurements are an estimation cooked to suit the family. The eagle is the king of the birds. Have you seen an eagle soaring above? Do you notice its speed, strength and power? Do you wish you can soar like the eagle? An eagle knows when a storm is approaching. It will fly to some high spot and wait for the winds to come. It will then spread its wings so that the wind will pick it up and lift it above the storm. The eagle does not escape the storm but uses the storm to lift it higher. We can be like the eagle soaring above storms. 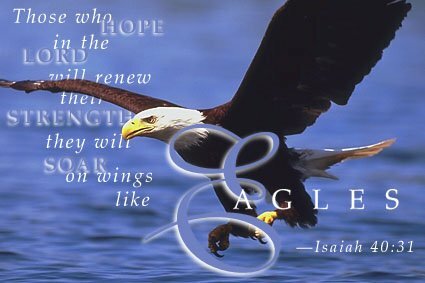 Isaiah 40:31 reads those who place hope in the Lord shall soar on wings like eagles. Let us rise above all challenges and difficulties that come our way and hope in the Lord to strengthen us. Let us fix our eyes on Jesus and focus on God's unfailing love for us.